The upcoming Medal of Honor has set a new franchise record for pre-orders and Electronic Arts is releasing the multiplayer open beta client tomorrow to make sure everyone has a chance to see it in action. 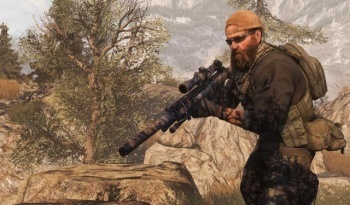 The Medal of Honor franchise has fallen on hard times in recent years but EA has high hopes for the upcoming reboot of the series, which moves the action from its traditional Second World War setting to the more modern ongoing war in Afghanistan. At least some of that optimism apparently stems from today's announcement that it has become the most pre-ordered Medal of Honor game of all time and with almost two weeks remaining before it actually hits shelves, it already ranks among EA's top pre-selling action games. It's not all roses, however. The bulk of the Medal of Honor games were released before pre-ordering became a priority for publishers and retailers, so setting a new record isn't necessarily a Herculean accomplishment. Nor does it provide any sort of useful barometer of how the game may fare next to Call of Duty: Black Ops, which is predicted to punch out 12 million copies over the holidays. EA declined to provide specific Medal of Honor pre-order figures. On a more upbeat note, the company also announced that the client software for the PC multiplayer open beta will be available for download beginning tomorrow, October 1. The open beta won't actually begin until October 4 but EA wants to ensure that everyone has "easy and quick access on day one." The multiplayer beta will feature two levels based on real-world locations: Kunar Base, a "Sector Control" level in which teams fight to control points on the map, and Shahikot Mountains, a "Combat Mission" map requiring two teams to battle through a series of tactical objectives. Both modes support teams of up to 12 players per side and feature "realistic destruction, tactical support actions and a weapon customization system that generates hundreds of combinations."